It has always made sense to focus on ‘collaborative work’ and innovation’. These are the very pulling together and pushing ahead of our development as a species. Our history of ‘success’ [if only just, we’re still here!] has been intricately woven within the complementarity of this ‘energy-field’. It is like a ‘musical riff’. Using this framework http://www.gci.org.uk/music.html musicians, in-time and in-tune with each other, have always done this. Andy Revkin rightly draws attention to the work of Elizabeth Burleson and William Moomaw, again recognizing and advocating those very points in response to more bathos at COP-17. William and Elizabeth, doing what you say makes complete sense as across all time, none of us could have proceeded anywhere without those values and that intent. What this says is that we can’t just look away and proceed as if that wasn’t an issue. It is a structural crisis with a massive international confrontation over it already and we have to address it as such. Rational people see this as a ‘fast-breeder-reaction’ and for the sake of our civilization, not-to-mention all the children, want to change these trends away from the disaster that looms and turn instead towards a recovery that is inclusive, rational, structurally resilient and in some sense at equilibrium. So, since the question is now ‘global’, how do we get push-and-pull back into that equilibrium at some level? Well we certainly won’t do it – as still happens at the COPs – by picking yet more numbers out of half a hat and yelling at each other, anymore than fiddle players try and play on broken strings and then, with blame attached, smash instruments over each other’s heads. It means ‘jihad’ in the pure and original sense that means bringing ‘truth and reconciliation’ to bear at the UNFCCC, noting this entails ‘climate-justice’ but ‘withoutvengeance’ and bearing witness to that. 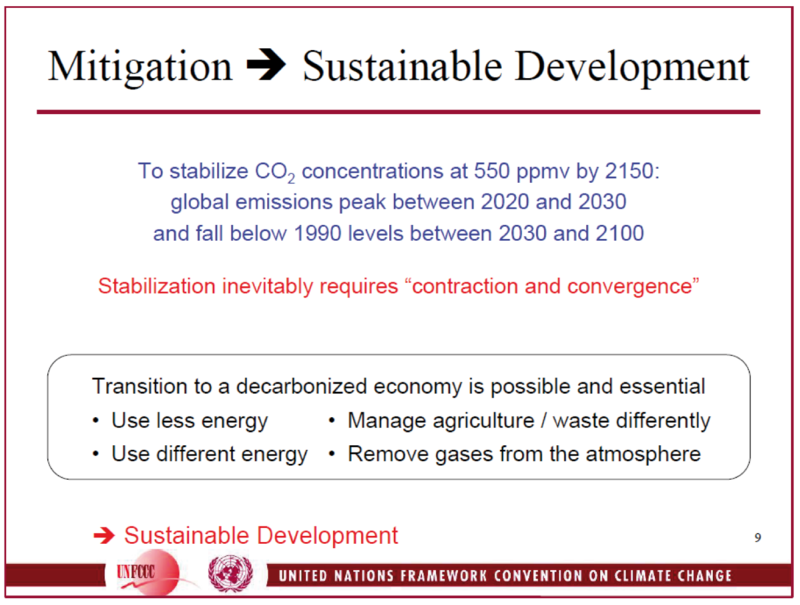 That is what the riff or the framework of the C&C principle brought to the UNFCCC negotiation. It is rational, structured, just and inclusive and it separates what must be limited to achieve ‘post-pollution’ from what is not. Naomi Klein’s forensic and brilliant analysis with the Shock Doctrine opens the curtain on this proscenium for equity and survival. C&C is not a ‘prescription’, it is a simple principle that, like the start of the US Constitution, has a core structure in equality and gives rise to a pragmatic negotiating framework: – http://www.candcfoundation.com/pages/whatis.html where the Parties to the UNFCCC can settle the differences rationally. Being in-tune with each other and, at much slower Herz, in time together, all music is possible because of that ‘constant’ and not in spite of it. All creativity flows from this. It is proportionality and as around any centre of gravity, like the Higgs boson, it is an attractor, or an energy-field or a concept-constitution. It ‘pulls together’ so that the ‘push’ is energetic, innovative durable and prosperous. Cooperation, innovation, the very fibre of success and so much else, are the very children of this. Accepting the C&C principle underwrites and enables the very success of the ‘Path to Post-Pollution’ Andy Revkin articulates and that we all so much want. You might think, seeing the umpteenth routine, stupid but lethal confrontation at COP-17 to the UN Climate Treaty, that the COP-UNFCCC process doesn’t yet demonstrate that understanding: – http://www.gci.org.uk/index.html and you’d be right. But, as all life aspires to the condition of music, we’ll see to that and push and pull so that it does, won’t we.